I've been a bit tardy in blogging due to work commitments, but The Paper Mask has made it into Grand Rounds again! This week's Grand Rounds is hosted by Prudence MD. PagingDr is back up and running, less a few hundred posts. There is a great deal of talk about what happened. I am not passing judgement on anyone involved. I have received this email and I post it verbatim, with permission from the author. Subject: a confession and an apology. Some time ago I had a discussion with several admins about possibly deleting my account and my old posts. Over the weekend I asked Kimmy if this could go ahead, as lately all I've been writing is "I don't think this is the way things work" to people who post incorrect things. It just wasn't fun to think and write anymore. The community had grown too large, too quick. On Monday I repeated the request to WB. which [details omitted], and then runs those 10 at a time. I ran them 10 at a time because I was being impatient at this point. I suspect the proboards system may not be completely up to people hammering it. I don't think it should be possible for a normal user to delete other people's posts. If so, it's a bigger security breach than I have any desire to exploit, anyhow. All I want is some modicum of privacy back. If/when you do restore the forum, please do not restore my old posts. Again, I'm sorry for what happened, and if you have any questions, feel free to call me on [redacted]. Edit 24/11/07: The relevant thread has since been deleted from PagingDr. Unfortunately something has gone wrong with the PagingDr forums. I don't know what, but my eyelid is starting to twitch from withdrawal symptoms. Breaking my silence to let you all know that the Paging Dr forum has been put into maintenance mode temporarily to protect the posts. A user deleted 400 posts in the space of nine minutes, and not just their own, which says to me they either don't know how to run a script properly or they're just malicious. Either way we don't care, we just don't want anymore deletions. The forum will come back up once we've spoken to Proboards and figured out how to protect its integrity. Would the other forum users with blogs also post this up so other forum users will know what's happened? We're not prepared to send a mass email just yet for other reasons. Hopefully it will be up and running soon. As a follow-on to a recent discussion thread over at PagingDr, I had cause to review the effect of the 10 Year Moratorium on Medicare Provider Benefits. This has been a big deal because it effectively limits non-Australian Citizens or Permanent Residents from gaining access to Medicare Provider Benefits. You may recall from the first instalment of my Mind the Gap Series that outside of the public hospital system the Federal Government funds medical services via the Medicare system (including the PBS and the Commonwealth Medical Benefits Schedule [CMBS]). This renders the Federal Government extreme power and influence over who delivers medical care to the community via the allocation and restriction of Provider Numbers, and also how that care is delivered via limitations, restriction and conditions placed upon services before they are eligible for reimbursement via Medicare. Note that this is a relatively roundabout method of control over medical practitioners. The Federal Government does not tell doctors what to do. They merely tell doctors that unless they do things in a specific way, satisfying Medicare guidelines and Ministerial Determinations, that their patients will not be able to have their medical costs reimbursed. Therefore in theory it is not the doctor who is being punished, but the patient. Unfortunately, the doctor is the one that the patient sees face to face. The bills and invoices carry the doctors name. If the patient can't get money back from Medicare or their insurance company, it is the doctor they complain to, not the 17 year old counter chick at the Medicare office, or the faceless call-centre operator on the end of the phone line. And if you are unfortunate enough to be one of the 90% of doctors that do not get payment upfront then you end up unpaid because the patient can't get their Medicare reimbursement. What does this have to do with the 10 Year Moratorium? Well, the 10 Year Moratorium is one of the limitations (along with Bonded Medical School Places) that the Federal Government applies to restrict access to Medicare benefits. It's purpose is to encourage doctors to enter and remain in the public hospital system, or to work in "areas of need" as defined by Medicare, brought in as part of John Howard's 1996 Provider Number reforms (More Info). It applies to Overseas-Trained Doctors who migrate to Australia as well as non-citizens and non-permanent residents who commence studying medicine in Australia. Basically if you fall into the target population, patients who see you in private (in your clinic or rooms) or on whom you operate in a private hospital will not have their medical costs reimbursed or subsidised by the Federal Government. In a system where patients are accustomed to paying little or nothing out-of-pocket this is tantamount to shutting these doctors out of the market, unless you do what the Government tells you to, and work where they tell you to work. Fine, it's primary purpose is to encourage doctors into "areas of need". But what about non-resident doctors who gain their medical qualifications in Australia? These include full-fee paying students from overseas, as well as New Zealanders (who are on Special Category Visas) who study medicine in Australia. These students take up valuable medical school positions, but are discouraged from working in Australia for 10 years after their graduation, when they have careers they can easily go to in New Zealand and elsewhere. Furthermore, they aren't banned from working in Australia - only from working outside the public hospital system. That means that they are free to pursue their specialist qualifications and postgraduate degrees (but GP trainees have to enter the Rural Training Program). After this, however, they have to go overseas or off to the bush (which increasingly means outer metropolitan urban fringes) to bide their time. It seems a colossal waste of university and hospital resources to train people who can easily avoid the rest of their Provider Number limbo by heading overseas (and most likely never returning). THE much-criticised system of regulating overseas-trained doctors has been dealt another blow, with the Department of Health and Ageing confirming the existence of a damning internal report on its distribution of Medicare provider numbers. Two years after the furore over the alleged criminal malpractice of foreign doctor Jayant Patel in Queensland, which prompted a concerted reform push across Australia, the commonwealth is under fire over its use of overseas-trained doctors to fill gaps in primary care and private practice. Section 19AB of the Health Insurance Act stops overseas-trained doctors receiving Medicare benefits for 10 years, unless, as temporary residents, they agree to serve in an area of need known as a District of Workforce Shortage. At the end of October, 4148 overseas-trained doctors had been given exemptions -- double the 2004 figure. More of Australia is being classified by the department as a District of Workforce Shortage and, with the staffing crisis now reaching into the suburbs, its own research has found Section 19AB exemptions are considered vital to filling outer metropolitan GP vacancies. But a report commissioned by the department last year pointed to serious flaws in the Section 19AB process, which has existed since 1997 and is now covered by six-year-old guidelines. A department spokeswoman confirmed doctor Eleanor Long, a renowned Australian medical education consultant, had used her report to recommend the guidelines undergo "major revision". According to the spokeswoman, Long wants the validity of the guidelines improved as they apply specifically to GP numbers through an overhaul of the District of Workforce Shortage process. Long believes more attention should be given to the factors leading to shortages, and how the department should assess District of Workforce Shortages and applications for an exemption from Section 19AB. The spokeswoman said Long also wanted the department to improve the reliability of the guidelines through the development of a proper assessment tool, in effect doing away with a largely discretionary process. Yet despite the findings, the spokeswoman said the guidelines were only being monitored and a statutory review of Section 19AB was not due until 2009-2010. Her comments suggest a review has been considered and delayed, given a department spokesman in July said a review of the guidelines would be undertaken within a year "with input from medical professional peak bodies". Efforts by Weekend Health to obtain a copy of the otherwise secret report have failed. Long is restricted by a confidentiality agreement, and a freedom of information application was rejected on the grounds that a review may yet occur and the information contained in Long's report might undermine the system. David Dennis, assistant secretary of the department's Workforce Distribution Branch, ruled "to the extent that the document exposes weaknesses or 'loopholes' in the current scheme, disclosure could compromise the integrity and viability of the decision-making process in granting or rejecting exemptions". Dennis warns of a premature public debate on the issue if the report is released. "This has the potential to disrupt the policy review process, delaying the important reforms which are intended to improve the operation of the legislation; and disclosure could disrupt the strong public interest or faith in the policy-making process leading to the allocation of Australia's medical workforce, particularly in relation to districts of workforce shortage." But it appears both overseas-trained doctors and Australian-trained doctors have lost faith in the department's short-term response to the doctor shortage. Surgeon Russell Stitz, chairman-elect of the Committee of Presidents of Medical Colleges, says the District of Workforce Shortage process is "flawed" and hides problems in the system. 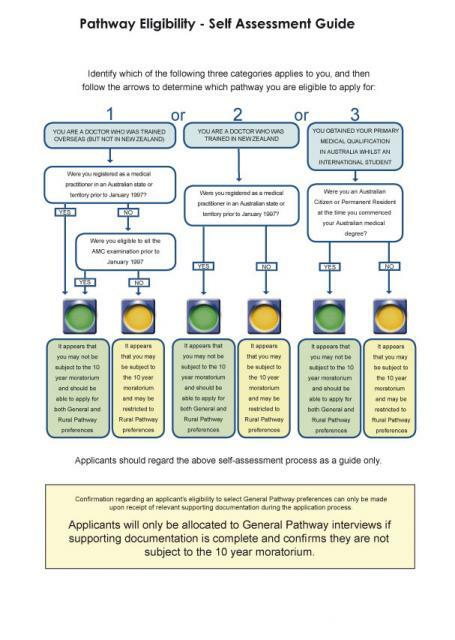 Stitz says the colleges should be involved in the assessment process to determine why Australian doctors are not filling vacancies and whether, for example, it is due to a lack of support staff or infrastructure. Andrew Schwartz, from the Australian Doctors Trained Overseas Association, says the Section 19AB guidelines are also discriminatory in that they favour temporary residents over permanent residents. "Australian Governments all favour temporary residents because they can be more easily restricted to where they work, and kept out of the private market," Schwartz says, again accusing the colleges of market protection. But Stitz says the colleges acknowledged the doctor shortage and believed there would continue to be scope for overseas-trained professionals to work in Australia. He says the Section 19AB exemptions should not allow doctors to bypass Australian Medical Council assessments and all overseas-trained doctors should first work under supervision to learn the system, the culture, and where they could seek help. "What happens with area-of-need specialists -- and you must feel sorry for them -- (is) they get brought in, often very rapidly put through the system, and sent to an area where they have no support and are expected to function in a very difficult environment." JOHN Howard's bid to upstage Labor with a promise of after-hours medical clinics has been undermined by a federal government report, which reveals suburban GPs are already struggling to meet demand and unable to recruit enough staff. The confidential report, which also damages Labor's policy, was written by Woolcott Research and delivered to the Government in August. 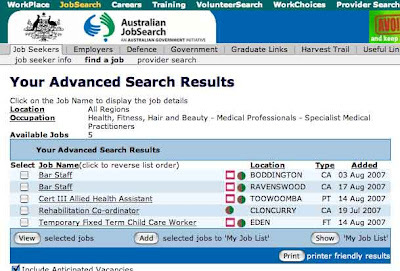 It advises the incentives it offered general practitioners to work in outer metropolitan areas had only limited success and 68per cent of clinics felt they were still short-staffed. "These outer metropolitan practices indicated that they were trying very hard to recruit doctors ... by various methods, but often these methods were unsuccessful and ineffective," says the report, obtained by The Australian under Freedom of Information laws. The Prime Minister has vowed to establish 50 Family Emergency Medical Centres, half of which would be open around the clock. Health Minister Tony Abbott argues the centres would complement existing clinics, unlike Labor's plan for GP superclinics on predetermined sites, which he claimed would compete with established practices. But while training more doctors has bipartisan support, GP shortages will continue for several years. The Woolcott Research report and the decline in bulk-billing indicates policies that congregate GPs at certain sites will only force patients to travel further for treatment. The report questions the Government's ability to address the maldistribution of doctors in outer metropolitan areas. Three initiatives are used to fill outer metropolitan vacancies: pay Australian-trained doctors a Relocation Incentive Grant of up to $40,000; force GP registrars to undertake a six-month placement in those areas; and offer to fast-track overseas-trained doctors into areas of need. "Whilst these initiatives have been successful to a degree, with relatively high numbers of doctors relocating to or increasing their hours in outer metropolitan areas as a result of the Relocation Incentive Grant, as well as the placements of registrars for their six-month periods, evidence suggested that they had not been fully subscribed, and that more recent uptake of the RIG in particular was declining," the report finds. GPs surveyed for the report found the RIG initiative was "viewed more in terms of being a retrospective bonus, and was not necessarily seen to offer sufficient incentive in itself to initiate the relocation of a GP." Australian General Practice Network chairman Tony Hobbs - who raised concerns over the Coalition's plan for 24-hour services - said after-hours clinics would succeed only if they had enough staff. Dr Hobbs welcomed any policy that fostered a team environment. "What we really need, though, and it's a big call, is an over-arching primary healthcare policy in this country," Dr Hobbs said. "What we've had is a piecemeal policy approach from both sides - something about clinics, something about practice nurses, something about dental care - but it virtually operates in a policy void without long-term, structured planning." I recently wrote about how to reduce hospital waiting lists. Modern technology has come up with a new way to reduce them, as evidenced here in the SMH. THE State Government has denied fudging hospital waiting list numbers, blaming the installation of a new computer for the omission of patients at two Central Coast hospitals from the latest lists. Opposition health spokeswoman Jillian Skinner said more than 3000 people waiting for elective surgery at Gosford and Wyong hospitals had been "conveniently" dropped from the September report. If those patients had been included, the latest result would have been 56,266 people waiting up to a year for their operations, an increase on the September 2006 figure of 53,424, she said. "They don't report this total figure at all in any press release and announcements, instead talking about a reduction in long waits [more than 12 months] which have gone down," Mrs Skinner said. A spokeswoman for Health Minister Reba Meagher said the hospitals' figures were not on the list, published on the department website, because of the installation of a "new patient admission system". I was recently alerted by Dr Clare Skinner (who features in this article in the AFR) as to the existence of this website, Clinicians Speak Out. To be honest, I am not 100% certain what the purpose of the website is, as it is set up like a blog, but seems to act a little like a noticeboard and a discussion forum in one. Nevertheless, the premise behind the organisation running it is straightforward - public hospitals need to be run with a clear vision and purpose. Underlying issues need to be defined and addressed, and covering up one crisis after another does not solve these issues. Attention needs to be paid to long-term planning, not short term politics. Kudos to those brave health professionals who are willing to speak out and put their names to their concerns about the public health system. Bravo to you, and may you have a positive influence on the administration of public health. I most certainly do not have enough courage to shelve my anonymity at this time. While the predominant focus is on public hospitals in the Sydney area (no doubt all the controversy about RNSH has brought this to the forefront, as well as the basic fact that the current NSW Health system is one of the most rundown, bureaucratic, paperwork-driven, responsibility-shedding and accountability-avoiding administrations I have every had the sad privilege of working in), every other public hospital system in Australia deserves the same attention. Medical Students are not GPs! Will they never learn? Kevin Rudd announced a commitment to build Family Healthcare Clinics for Defence Force members and their families. That doesn't bother me one little bit. Go for it, Kev. This statement, however, left me frustrated that both major parties continue to fail to appreciate how the medical workforce works, and illustrates the simplistic concepts that seem to underpin major decision making amongst politicians and high-level government. He denied it would be difficult to attract staff to the new medical centres, saying Labor would also invest in more medical places at universities to boost medical workforce numbers. Every time the lack of doctors to staff new facilities is raised, the same response is trotted out: recruit more medical students. It sounds good. It doesn't make sense. Prime Minister John Howard's February 10 announcement of a new health package at the Council of Australian Governments (COAG) meeting has drawn both criticism and praise in its addressing of the ongoing shortage of qualified doctors. At what Prime Minister Howard described as "an unbelievably successful COAG meeting", a package of health reforms were agreed upon by state, territory and federal leaders. In addressing the shortage of trained doctors COAG announced that there would be 25 per cent more university places made available to train new doctors but that they would be full-fee paying university places. As a part of this, incentives are to be made to increase the number of qualified doctors which includes raising the loans cap for full-fee paying medical students from $50,000 to $80,000. Putting aside the qualifications that are always involved in these pronouncements ("money is being provided - but it's up to universities to implement them", "money will be invested into innovative new training schemes", "private sector training will be explored") keep in mind that many of these places will be full-fee paying (i.e. only minimally subsidised by the Government) and that they could well be occupied by overseas candidates (i.e. ones that do not contribute to the Australian Workforce). The lag time between recruiting a medical student and producing an independently practising doctor is significant: a minimum of 4-6 years before an intern is produced. Such an intern cannot staff a GP clinic. It takes another 4-6 years to do that, assuming that there are enough accredited training positions. Depending on the specialty, such positions are limited by State Government funding of public hospitals (such as for surgery, medicine, and all of those hospital-based specialties), or by the Federal Government (via Vocationally Registered Provider Numbers for GP Trainees). Furthermore, Provider Number and Medicare limitations means that unless a doctor completes a training program and achieves specialist recognition (including completion of GP training), they are effectively unable to service patients in the public sector. The 1996 Howard Federal Government hobbled its own ability to fill the need for GPs in its overexuberant attempt to reign in Medicare expenditure (Link 1, Link 2). Of course, the traditional response is that training numbers are limited by Specialty College intakes, lining the pockets of specialists along the way. 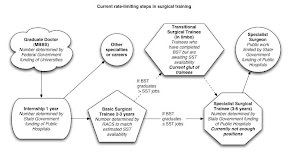 In reality, the Colleges go out of their way to accredit as many viable training positions as possible, but such positions can only be worthwhile if there is enough funding to treat patients and maintain throughput. This is and will continue to be the bottleneck limiting the production of independent medical practitioners. Long-serving readers may recall that I have written about this before and while the terminology is being superceded by SET and PreSET, the basic principles remain the same. There is a lot of talk about the impending "medical student tsunami". There is no doubt that we are turning out record numbers of medical students. Hospitals are also absorbing record numbers of Interns and RMOs, due to the enforcement of safe working hours, and the desire of these new generations of doctors to have a life outside work. These doctors are typically employed, however, in non-training positions. Despite the best efforts of specialty colleges to approve more training positions, they are stymied by hospital and Medicare's Vocational Registration infrastructure. New graduates (and governments) are developing an expectation that they will come out of medical school and go straight into a training program, emerging as a specialist in the minimum amount of time possible. Unless the incoming government realises that they will not be able to adequately staff these GP clinics without stealing GPs from other parts of the medical workforce, or they address all the rate-limiting steps in medical training, then we will continue to see short-sighted, short-term, sound-bite based health policy and workforce planning in Australia. We don't need politicians and political parties that make knee-jerk decisions and can't see beyond the next press conference. Unfortunately, that is all that we have to choose from. THE spouses and children of defence force personnel living in remote areas of Australia will have their medical and dental bills paid under a Labor plan to help retain troops. Unveiling Labor's defence policy at the Lavarack Barracks in Townsville yesterday, Kevin Rudd committed $33.1 million for 12,000 ADF spouses and children to access free health and dental care at 12 Defence Family Healthcare Clinics. The first two clinics will be at the Lavarack Barracks, in the marginal Liberal-held seat of Herbert, providing services for about 4000 spouses and children, and the Robertson Barracks in Darwin, which will cover 3650 spouses and children. "This is the first time free medical and dental services are being extended to the spouses and kids of defence force personnel," Mr Rudd said. "This policy ... is an important step forward in providing a better standard of living, a better quality of life to continue to attract people to join the defence force and to stay in the defence force," Mr Rudd said. In 10 of the clinics, the GP will work half a day, five days a week, with a full-time nurse five days a week. A dentist and dental nurse will work five days a week. Labor defence spokesman Joel Fitzgibbon said the health plan could be rolled out more broadly if it was successful. "This is very much a retention initiative designed to put something on the kitchen table as defence families are considering whether to take an offer outside the ADF or stay within the ADF," he said. Mr Rudd said that in recent years the structure of the defence force had been "torn in multiple directions". "There had been an absence of clarity of strategic purpose, including asking our force structure to be able to maintain simultaneously hot operations in the theatres far from Australia as well as other operations near to Australia in our own immediate sphere of strategic importance here in the Southwest Pacific and Southeast Asia." Mr Rudd said the ADF needed direction on what was expected of it in the future. Labor was committed to all current defence projects but would ensure a new defence white paper returned discipline and strategic coherence to the Defence Capability Plan. He said federal Labor would ensure defence was adequately funded through a commitment to at least 3 per cent real growth in spending each year. Labor would also commission the defence white paper if it won government, with Mr Rudd asserting that defence procurement under the Howard Government had become a "rolling scandal". "We are determined in Government to ensure that we've got the processes in place to make sure there is rational long-term planning for our equipment requirements ... which is in turn consistent with a strategic doctrine laid down in the white paper," he said. "When you look at the long-term force structure, quite apart from immediate operations here in our own region and war-fighting operations currently occurring in various parts of the Middle East, it's very important that clarity is achieved in a new defence white paper, and that the full structure evolves from that." The Australian Industry Group (Ai Group) has said that it is confident these reforms will help assist the skills shortage currently facing the nation. "COAG has taken important steps in helping the alleviation of skill shortages by agreeing to this raft of reforms," Ai Group chief Heather Ridout said. Queensland Premier Peter Beattie is "delighted", as he says his state's health system will benefit – he has been lobbying for more than 300 new doctor training positions in his state. Meanwhile Australian Medical Association President Dr Mukesh Haikerwal told the ABC that the increase in university positions will help the current shortage of Doctors. He said that it is important that enough doctors are trained but he said for that to be on a fee-paying basis is against the principles of university training and the principles of equality of access in education. Dr Haikerwal foresees medical degrees costing students as much as $250,000. "You know, you could have an awful lot of well-qualified people that could do medicine and do it well, having to give those places up because they can't afford this sort of money. If government is serious about getting doctors into the system and is serious about training doctors, then they need to pay for those places under the HECS system as they currently do," said Dr Haikerwal. Doctors Reform Society President Tim Woodruff was also critical of the proposals. He said the full fee-paying medical student places were offered "to produce doctors who aren't good enough to qualify for HECS funded places". Australian Vice Chancellors Committee CEO John Mullarvey, says he would have preferred the places to have been fully-funded by the Government. Opposition spokeswoman Jenny Macklin saying that only government-funded university places would have helped. "At the University of New South Wales, a medical degree costs $216,000. That leaves a huge gap for students to have to find," she said. "We want to make sure that our doctors get there on merit not on how much their parents have got in the bank." The Opposition also claims that Australia's university sector is being "Americanised". The commonwealth will contribute $666 million to the health plan while another $479 million will come from the states and territories. I came across this article in the Financial Review a few weeks ago. Unfortunately it is not online, so I have had to transcribe it manually. It raises a lot of issues - the declining status of doctors in our society, the hotch-potch of remuneration packages needed to fill gaps in medical staffing due to poor workforce planning, the loss of job satisfaction and thus the reducing amount of dedication to the job amongst new doctors. In the same way that IT workers might flit from consulting contract to consulting contract, doctors are increasingly moving from locum position or locum position. Just as the mining boom is stealing young workers away from their apprenticeships, medical workforce gaps and locum positions steal young doctors away from their long-term training programs. Why should you spend arduous years, giving up family time and being worked like a dog, when you can go somewhere in rural Queensland and be paid handsomely for something that you could do in your sleep? Is There A Doctor In The House … At Any Price? They used to have status and money. They also worked long hours. But medicine is in transition and the public may pay the adjustment price. At Malcom Parmenter’s first annual meeting as chief executive of a health-care group, he met a couple of former patients who had bought shares in his new company. The former general practitioner runs the Independent Practitioners Network, which represents 90 medical centres, 700 doctors and the corporatisation of medicine. The shift from a physician’s life to a fiscal life was an obvious one for an entrepreneurial GP, but one that still troubles him. In an extended economic boom, when CEOs can earn $33 million, when young equity players get million-dollar bonuses and 26-year-old lawyers can earn more than half a million dollars in London firms, it’s easy to appreciate the frustrations of doctors, who were once top of the tree and now feel they’ve been hung out to dry. But the medical profession hasn’t just lost its mantle as the highest-paid and highest-status job in the country. It is devolving into a well-paid pastime, where few want to commit to a practice, a hospital or even regular work shifts and where the rewards go to those who opt out of the mainstream. A crucible of pressures has delivered this discomforting outcome. A profession regulated by not one but two layers of government has met the globalisation of the workforce as well as the changing lifestyle preferences of a younger generation of doctors. Then there are the perverse incentives that reward casuals and punish loyal staff. As a result, says Tasmanian Australian Medical Association president, Professor Haydn Walters, “doctors have come to regard themselves as well-paid casuals”. Walters has been battling the federal government’s recent decision to takeover the hospital in the marginal Tasmanian seat of Braddon and restore services the state government had cut. Fighting “political stuff-ups” such as these is just one of many skirmishes that medical lobbyists such as Walters engage in today to keep the profession viable. Walters believes two small hospitals on the east coast of Tasmania are not viable, for doctors or patients. The crisis in the medical system has almost become a cliché in news pages. But the politics of today makes yesterday’s reporting of hospital waiting lists look like a very small picture indeed. On Thursday, Labor leader Kevin Rudd made his own systematic assault. He pledged $2 billion to reform the nation’s hospitals by hitting on the hot spots: acute and aged-care beds; accident and emergency services, as well as dental, mental and disability services. He is also talking about somehow improving the interaction between the general practitioner – funded by the federal government – and the hospitals, which until this phony election campaign began, had been the exclusive preserve of the states. On the same day Rudd made his announcement, it was revealed that the Royal Australasian College of Physicians had banned Shellharbour Hospital in NSW from training junior doctors because of the lack of supervision and heavy workloads. The state of emergency rooms, the use of acute beds for the infirm and the transfer of GP after-hours care to hospitals are at the heart of concerns expressed by the medical community. These systematic problems are the landscape inhabited by an already stressed profession, worried it is losing control of its working environment, losing power in the community and losing heart in its future. While doctors are still among the highest paid workers, their relative pay has dipped, with medical specialists ranking sixth highest respected in society, they’re not so fondly regarded as they once were. 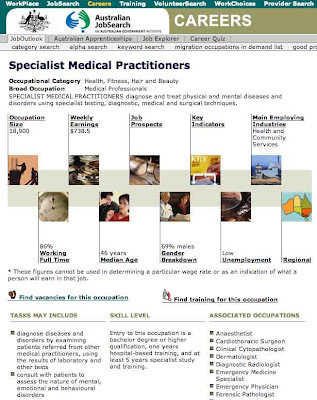 According to a Roy Morgan survey on the image of professions, they’ve slipped from No. 1 position 20 years ago to third, after nurses and pharmacists. A large part of this relative decline can be blamed on the two forces that routinely depress both wages and status – globalisation and feminisation of the workforce. The mass entry of women into medicine over the past few decades has meant that one-third of practitioners are now women. Their impact on working styles is a major topic of discussion in the profession. The more recent influx of overseas-trained doctors into the system has brought the percentage of foreign doctors to 25 per cent overall and up to 50 per cent in regional and rural areas. Their impact is not so readily discussed. Stephen Leeder, co-director of the Menzies Centre for Health Policy, says the shift to a part-time workforce “could be defended from a feminist critique of not clinging to the male model of work, but in reality working part time is not as respectable as working full time. The tendency of female doctors to shun specialty training in favour of general practice, and then to work part time when they have families, has been compounded by the impact of generation Y men. Says Walters, “the feminisation of the workforce meant that 50 to 60 per cent of graduates are not looking at their career pathways in the same way as previous generations. Now gen Y men have very similar attitudes to many women. They want lifestyle, flexibility, part-time work and they want to travel, and those aspirations are very unlike my generation. “The norm when I trained was to expect to be stressed, work long hours, onerous rosters and continue working like that for 30 years. People are not going to commit to that anymore, so you need twice the number of people covering the work and you’re not going to get the same amount of training because doctors are working half the hours. “So doctors are half as experienced as they once were, and there’s an intense shortage of doctors and that leads to other problems such as the increased reliance on locums,” he adds. The move to part time is reflected in doctors’ average weekly working hours, which have fallen from 48.3 hours in 1995 to 44.4 in 2003 – despite the long hours that registrars and interns work in hospitals. The fastest rate of decline was among male doctors, where hours dropped 7.4 per cent compared with 6.4 per cent for females. While part-time medicine has mostly dominated the GP end of the profession, it is now spreading through hospitals under the locum system, which has grown from a poorly regarded niche to a much-sought and well-paid career path. Walters adds: “It’s now the norm for someone in their third year out to give up full-time work so they can work as a locum for three or four months and earn enough to travel for the rest of the year before resuming their fourth year”. The gap year for young doctors is throwing emergency rooms into chaos, according to an ER registrar, Clare Skinner, who produced an academic paper last year on the use of locums and works with them at a major Sydney hospital. Her concerns were echoed in Kevin Rudd’s reform package. In her report for the Greater Metropolitan Clinical Taskforce, Skinner found that locums now represent half the ER workforce in many small hospitals and are also appearing in major hospitals. Locums earn more, work fewer hours, have less responsibility and can pick and choose their shifts because of the chronic shortage of ER staff. “It’s frustrating for permanent staff like me to work with junior locums who can earn three to four times as much as you do. I get $37 an hour and locums can earn between $100 and $150 an hour and because they pick whatever shifts they want, the permanent workforce ends up doing the left-over shifts that locums don’t want to do,” says Skinner. The locum workforce is comprised of three main types of workers. Some are senior staff, close to retirement who generally pick up regular shifts and can earn a week’s wage - $1100 to $1500 – in one shift. Others are more junior trainees, who have decided to work a gap year as a locum. And the third group are overseas-trained doctors. The foreign-trained locums, says Skinner, “often do it because there is no official credentialing and they can walk into an ER locum job even if their background is working in a Third-World hospital where they can only hand out Nurofen”. The impact of locum work is not good for morale. A similar lack of commitment is re-engineering general practice and Malcolm Parmenter isn’t the only GP who has decided that lugging a little black bag around 24/7 is no longer a great career. “It’s all about money these days,” says Parmenter. “Even though most graduates start off with those ideas of helping people and making a difference, they quickly realise the bottom line of general practice. And general practice is a narrow-margin business that’s increasingly low paid compared with other professions. “I spoke at a general practice conference recently and one of the speakers asked the 50 or so registrars there how many of them wanted to own their own practice and just one person put their hand up. “Obviously there are generational issues with younger doctors less willing to commit, more female GPs [who] want to work part time and many more guys who don’t want to work the 40, 50, 60 hours that their counterparts worked in the past. “It’s a part-time industry and there’s a large group who went into medicine for the lifestyle, and motivation them with more money is not the answer because they either don’t want it or don’t need it,” he says. While there are hints of generational conflict between those raised in the medical school of hard knocks and those who want a life, not just a job, the ageing demographics of the medical profession will accelerate the part-time work brigade. One in four doctors is over the age of 55 years and in the next few years many of those will be looking for the odd locum shift or a Saturday morning shift in the local practice. The impact of foreign-trained doctors is both a moot and a mute point in the profession. Most acknowledge it as an unavoidable consequence of government decisions in the late 1980s and 1990s to reduce the number of medical graduates in Australia. In 1980, there were 1278 graduates, in 1990 it fell to 1030, and even in 2005 it had only risen to 1348. If part-time preferences and the dumbing down of the profession isn’t enough, most doctors will mention several other negative influences on their working life – and most will speak for longer than the preferred six-minute billing unit on these subjects. Walters, like many, cites the shift of resources from public hospitals to the private sector as a major concern. Skinner laments the collapse of the after-hours GP visits, which has filled ER wards with chronically ill patients at the expense of casualty patients. Stephen Leeder cites micro-management by bureaucracies, litigation and changing social roles, which “have changed the old relationship between a doctor and a patient because patients turn up with wads of pages fro Wikipedia and treat the doctor as a useful arbiter but not much more”. In an era where a disgraced CEO can get a golden pay-off, doctors are upset that one mistake can destroy them. The plight of Australian doctors is hardly local. Michael Moore’s Sicko documentary has indicted the American health system; UK doctors are under even tighter government control, and medical systems in the developing world are being abandoned by their own doctors for First-World salaries. (Stephen Leeder points out that there are more Malawi doctors practicing in Manchester than Malawi). But the larger concern is that the way medicine is practised today is undermining both the value of the profession and the sustainability of the system. As Walters points out: “Australia is still a pleasant place to work and that’s partly because doctors can manipulate the system to do what they want. Huge amounts of money are being used to patch up the system and doctors can see that. They can see that they can work at, say, Mersey Hospital and earn half a million a year and retire in a year or so; or they can spend a few months working as a locum and go travelling for a year. But none of that is sustainable for the system as a whole. “We in Tasmania are the future. We’re ageing before other states, we have a lack of funds for health and a dispersed population and we were getting our act together as a state – and then John Howard comes in and undermines all that. Skinner, at 33, answers the question with facts. Two years ago, she earned the same salary ($62,000) as a friend who was a teacher. In another year or two, she’ll earn $89,000. In 2½ years she’s had two weekends off. Malcolm Parmenter has made his decision, although he admits he mostly enjoyed his days in practice. He says he’d probably choose it again, “but whether I’d choose general practice again, I don’t know”. By the way, I can't vouch for the accuracy of the figures given at the end of this article. "Your mission, Kevin, should you decide to accept it, is to radically cut elective surgical waiting lists. Your target is to ensure that no patient is waiting beyond their waiting list category time. As usual, should you or any member of your I.M. Force be captured or killed, the secretary will disavow any knowledge of your existence. This tape will self-destruct in five seconds. Good luck, Kevin." Spend some money to give the appearance that we are doing something that might work, even if it won't. For example, let's take, say, $100 million and give it to private hospitals, because public hospitals are crap. They can take care of a few thousand patients in the short term to buy us some time. We all know the patients will keep being added to the waiting lists faster than we can operate on them, but at least we'll look good. Let's ring up as many waiting patients as possible and try to convince them that they don't really need or want the operation. Even better, if they don't answer the phone or we lose their phone number, we'll say that we tried our best but have no choice but to take them off the waiting list. We can starve the public hospitals of funds to buy or maintain essential equipment to do operations. If the hospital is physically incapable of doing the operation we can justify delaying these operations and classify the patients as "Not Ready For Care". Ring up some more patients and tell them that they can have their operation at another hospital more quickly, as long as they agree to be done by a surgeon that they've never met, who won't talk to the surgeon that they have met and who may or may not be as good as the original surgeon. Then they will have to repeat all the tests again only to decide on the day of the operation that maybe they didn't need the operation in the first place. If the patient refuses we can take them off the waiting list, or say that it's the patient's fault that they are waiting. Fine hospitals even more for having patients waiting beyond their projected waiting time, so that hospital administration pressures the doctors to clinically reclassify patients to a less urgent category. It won't be our fault, because we'll just provide the incentive to perform better, as long as hospital executives don't tell us what they are up to. Redefine the waiting list categories so that the projected waiting periods are longer than before. That way it will be harder to run over time. Define the official date that a patient goes onto the waiting list as the date that the clerks type the form details into the computer system, not the date that the doctor filled out the form. That way we can have an extra month of physical waiting that doesn't count towards the statistics. Give the clerks in the waiting list office more tea breaks, and put them in a small, dark, cramped, noisy office to minimise their productivity. Therefore it will take longer before a waiting list form is physically processed, and the official waiting period will start later. Refuse to add patients to the waiting list unless they have their operation physically booked before entering it into the computer. That way, not only do we stay within the official target times, but we look fantastic because the patient can be physically waiting 3 months, and officially waiting one week. Stop these bloody doctors from putting patients onto waiting lists in the first place - let's block entry into outpatients by creating a waiting list to see a doctor, and then offer to let them see a nurse practitioner who will tell everyone that they don't need an operation. We can trust nurse practitioners to do what they are told. The detailed operational plan can be reviewed here. Federal Opposition Leader Kevin Rudd has unveiled details of Labor's $600 million commitment to slash elective surgery waiting lists across Australian public hospitals. The money forms part of Labor's previously announced $2 billion health commitment. Under the scheme, a federal Labor government would hand $100 million to the states and territories to enable public hospitals to purchase operations from private facilities. Mr Rudd says there are 25,000 Australians on elective waiting lists who have passed the recommended time for surgery. "The 25,000 people we are talking about, they are there now OK," he said. "We've got an election due in November. If we win that election what I want to see is money flowing as of January 2008, out to the states and territories in order to make payments to get that 25,000 number down to zero by year's end." But in return for the funding boost, the states would be expected to report back on their progress. "As we speak, we will not be extending to the states a blank cheque for any of these amounts of money," Mr Rudd said. "We will be insisting with the states that report cards be produced." According to Deborah Powell from the New Zealand Rabid Dogs Resident Doctors' Association, Australian doctors are paid well above that of New Zealand doctors. Apart from the fact that New Zealand doctors have working conditions and education allowances that doctors in Australia regularly salivate over, have no need to worry about medical indemnity insurance, work with nursing staff who in general are far more co-operative than Australian nurses, and otherwise live in a beautifully scenic vista, they have clearly drawn the short straw. 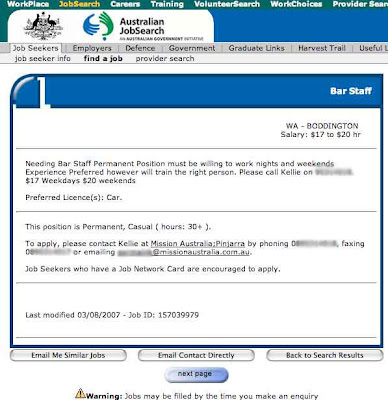 I don't know where this job in Australia where an intern is paid $75 an hour is, but I'm moving there once I find out! An ongoing shortage of junior doctors is a threat to the delivery of services at Waitakere Hospital. That's the message from the New Zealand Resident Doctors Association. Spokeswoman Deborah Powell says too many of country's medical students are leaving our shores as soon as they graduate. "This year we've lost 20 to 30 graduate doctors straight to Australia," she says. "They aren't even starting practice here. "There's no point producing them if they don't start to practice here. "We can't continue to deliver services if we don't have the doctors to do it." Waitakere Hospital falls under the jurisdiction of the Waitemata District Health Board where the vacancy rate for junior doctors is 34 percent. Mrs Powell says remuneration is a factor, with the health boards offering a 3.3 percent pay rise over the next year. She says that is not enough to attract young doctors. "We're getting to the point where there won't be a doctor available to see you when you need one." Mrs Powell says international recruitment is not the answer because New Zealand's pay rates are too low to compete. She says resident doctors start on $23 an hour here, compared to $75 an hour in Australia. "What we have to do is retain our own doctors." Rachel Haggerty, the health board general manager of adult health services, says the problem is nationwide. She says Waitemata is working closely with the Auckland district and Counties Manukau health boards to address the issue and reduce the workloads now faced by junior doctors. "The problems we are facing are no different than any other hospitals around the country," Ms Haggerty says. My Brain Is Competing With Itself! After seeing Adam Spencer talk about this on television a few days ago, and then M&TS write about it on her blog, I decided to check out this link. Initially I saw it moving clockwise, but 30 seconds later it was moving anticlockwise. Now it changes direction every now and then. Is This Where My Career is Heading? I thought I'd click on the link entitled "Find vacancies for this occupation". Personally, I don't think that I would do 6 years of undergraduate training, and over 10 years of postgraduate specialist training, so that I could apply for a job as Bar Staff. Admittedly, $17-20/hr is better than what I got as an intern. gasboy07 from My ETHEReal Adventures (link removed) has taken down his blog. Thank you everyone who has been visiting my blog in the past - as you have noticed I have had to remove it, based on advice from a few people. It is unfortunate, but such is life. Even worse, after gasboy07 deleted all of his posts and deregistered his blog, the web address has since been hijacked by some entrepreneur who has put up a web page mimicking gasboy07's blog, and redirecting readers to a whole bunch of advertisements and questionable links. I recommend that you do not visit to gasboy07's blog, and if you do, don't click on any of the links. In a disturbing development, it seems that someone has mananged to get to the URL that my blog used to live at, pasted something from google cache, and redirected it to ads in such a way that the google spam bot won't pick it up. I'd like to say that I had nothing to do with that, and have hopefully taken sufficient action to have the site removed. Thank you to all of those who have pointed it out to me and sent me their concerns. I have previously given my opinions on the treatment of Dr Mohammed Haneef. Tonight's 4 Corners program on the ABC has given a good summary of the situation so far. Milk & Two Sugars from Tea at Ten recently made a post about being uncomfortable when scrubbed in theatre. I gave her some suggestions in the comments, and she suggested that I post my tips to my own blog, so here goes. Make sure you have a piss before you start. Or get a pair of those NASA astronaut undies. Do calf pumps and change your stance regularly, or else you will get venous stasis and pass out more easily. Whenever you can, rest your hands and or forearms on the operating table. Preferably not the patient, as they can get pressure areas from you leaning on them for too long. Don't wave your hands around (especially over the wound) unless you want to get stuck with a needle. And remember to maintain sterility. Always let the surgeon know when you are uncomfortable. They will understand. Better a moment to change position than a medical student unconscious on the floor (or in the wound). Try to engage in banter (where appropriate). You are not the only person who is bored and can't see much - the primary surgeon is the only one who is actually doing something interesting. Mind you, as soon as you have something to do, like a wound to sew up - you will wake up immediately. Also don't feel that you have to talk medicine all the time. It may be hard to believe, but even surgeons have outside interests, and sometimes we are actually interested in you as a person, not just a student. Tie your mask a little loosely, and tape the top edge to your nose. That way it won't ride up and you can breathe air in from around the edges of the mask when necessary. Make sure you have eye protection - find some goggles if you don't like the full-face masks. Often hospitals will stock very cheap disposable ones, or buy one between several of you. Don't stick your head in the light. The surgeon loses their lightsource, and you get very, very hot. And then your head explodes, which makes a big mess. Don't inhale diathermy fumes on a full stomach and don't wave the laparoscope around (both in the patient or outside). The smell of vomit tends to hang around the scrub sink for a few hours, and there is nothing like a laparoscope shining in your eye to make you go blind for a few minutes. Check out what step sizes are available beforehand - it is more important that you are at a comfortable height than whether you have the best view. You don't want a sore neck, back or shoulders for the rest of your life. If you are not too keen on getting your hands inside the patient, then sometimes the best vantage point comes from not being scrubbed. Crossing the blood-brain barrier can sometimes give an excellent view. As long as you can see, there is no need to scrub - you can just join in at the end when there is a wound to suture.